Type: BOOKS. Detail: Pritchett, C. Product Code: 9781857446197. 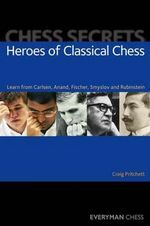 This book celebrates the play of five great heroes of classical chess. In doing so it aims both to entertain and instruct the reader in the art of playing classically direct chess, as it has developed over the last hundred years or so. Style is an elusive quality in chess. By classically direct chess I imply a kind of universality of play that embraces all styles, in a sense, and transcends narrow boundaries a style that is based on such overarching attributes as clarity, energy, toughness, ambition and a fundamental sense of analytic correctness. My heroes are all supreme in the art of divining and following the strategic and tactical threads of a game. They see chess primarily as an organic whole, not as a series of artificial phases. They dont attack or defend for the sake of it, but only when the position demands it, and they are equally at home whether playing the opening, middlegame or endgame. The choice of Rubinstein as the first player to be featured makes perfect sense. Though his last tournament game was almost 80 years ago there is no question that the great Akiva was a trailblazer the first player to treat all phases of the game as closely connected. One of the featured games, RubinsteinTarrasch, Carlsbad 1923, is an especially fine example of his holistic approach. The fivefeatured players (Carlsen, Anand, Fischer, Smyslov and Rubinstein) are each given seven games to illustrate their special abilities. These games are heavily annotated, primarily with prose but concrete variations are given when needed. Pritchett does a fine job of explaining the background behind the games as well. A great way to improve your middlegame play. Softback, 224 pages.